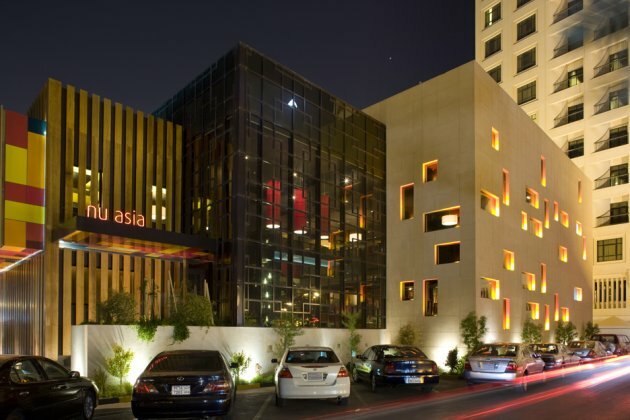 UK based architects and designers SHH have designed and branded a new three-storey, 50,000 square foot, 300 seat restaurant in Bahrain called Nu Asia. Visit the website of SHH – here. 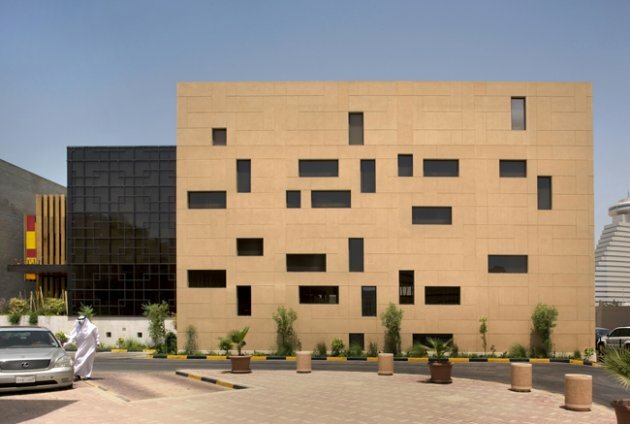 SHH designed the new building as three elegant interlocking volumes, each one larger than the last and variously clad in timber, glass and stone. The first 8.5m high ‘box’ is clad in dark timber slats, allowing the light to shine through dramatically at night-time, whilst protecting against the searing daytime sun. A grand stone entry staircase in Galala marble is located in front of/alongside this first timber slat elevation. The staircase is set beneath a high-impact cantilevered entrance canopy, inset on the underside with brightly-coloured mosaic-style tiling, linking in both to the shapes used on the third stone volume of the building and to a fabric two-storey wall created as part of the interior treatment. The second 9.7m high ‘Chinese lantern’ box is clad in dark glass and features applied aluminium mullions in a geometric pattern, whilst the third and final 12.2m high box is clad in stone, in the colour of sand to blend in with its environs, in seemingly random grain patterns. 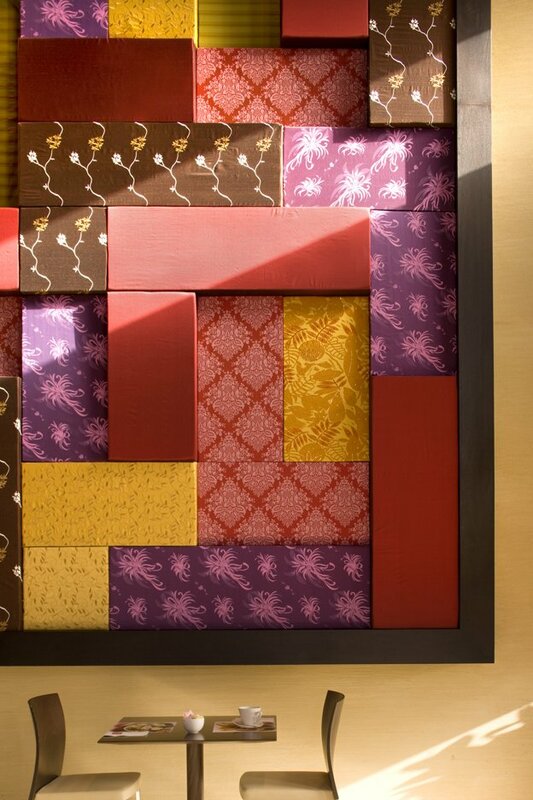 In fact, the striking geometric pattern was achieved by turning the basic stone module pieces either vertically or horizontally with filler pieces in between for tolerances. 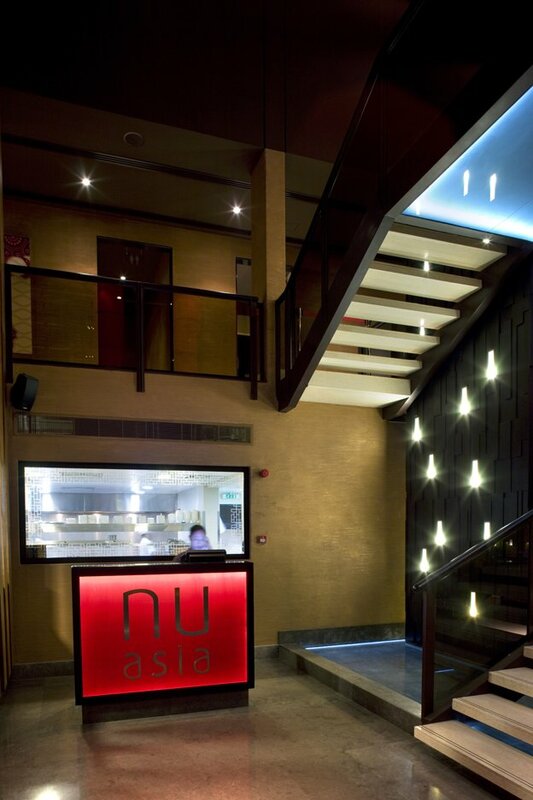 The Nu Asia brand, designed by SHH to a name chosen by the client, was conceived as a two-stage design: both as a typographical marque and as a holding device, with an accompanying background (as used in the entrance canopy). The idea behind the branding was to sum up the essential warmth of Asian cuisine and was inspired by the vivd colours of spices. This rich and colourful palette then contrasts with a crisp typography – applied in stainless steel for the restaurant’s external signage. For the door and backlit reception desk signage, a simplified version of the identity is used, employing the same ‘dax’ font for its Asian typographical characteristics. Internally, the building is arranged with a first kitchen on the lower-ground floor (which was only able to be set one metre down because of the water table), along with a staff area. The size of the kitchen reflects its additional role, helping to serve other local restaurants owned by the same client. 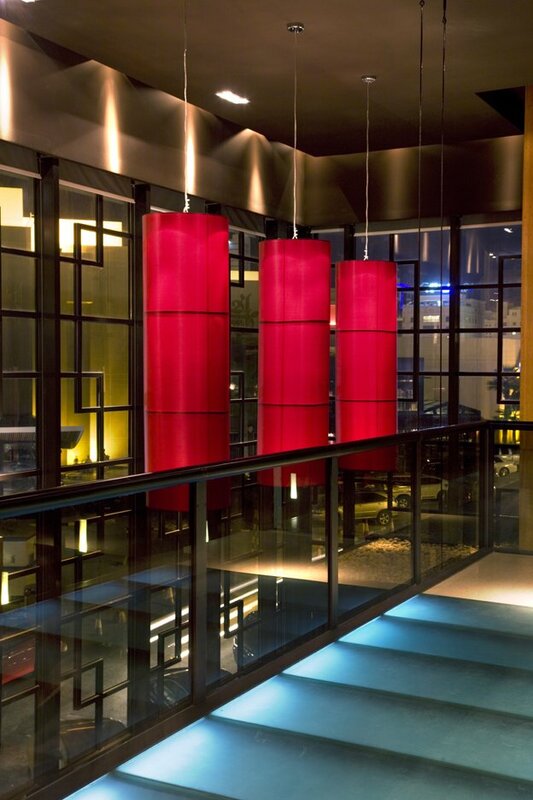 A glazed reception/lobby area on the ground floor contains the circulation, with a service core located near to the restaurant space. A second, open and more theatrical kitchen is located on the ground floor and is semi-open for diners to catch glimpses of the chefs at work. A series of six columns break up the ground floor space. From the main entrance, guests pass a planter strip, bringing greenery into the scheme, before arriving at the restaurant reception. 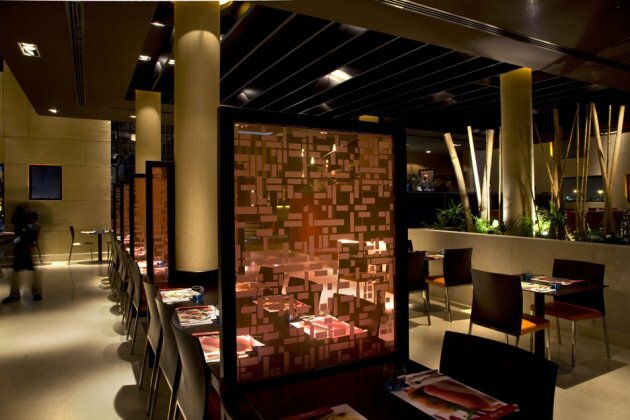 A second planter strip is included further into the restaurant itself. 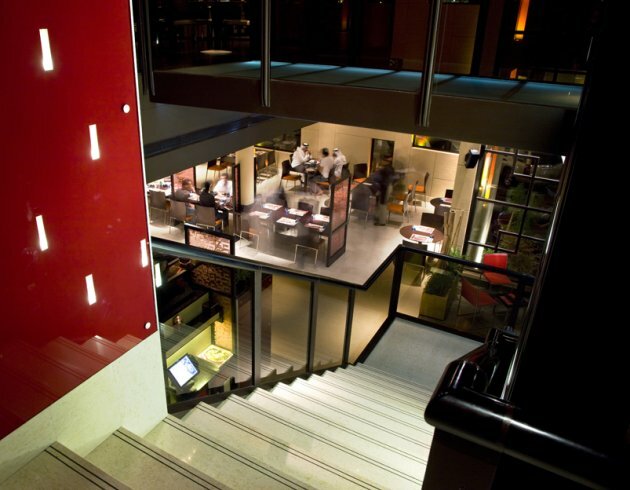 Galala marble, as used for the grand stone entry staircase, is used continuously across the front section of the restaurant floor, with a darker stone area demarcating a rear zone with a slightly more formal feel. Walls are in a sandstone render. Outside the opposite wall from the entrance lobby, an electrical substation also had to be built into the scheme to comply with landlord’s requirements. The first floor area is accessed via a lightweight stair with a central timber spine, which looks down on a reflecting light pool, set at ground level. 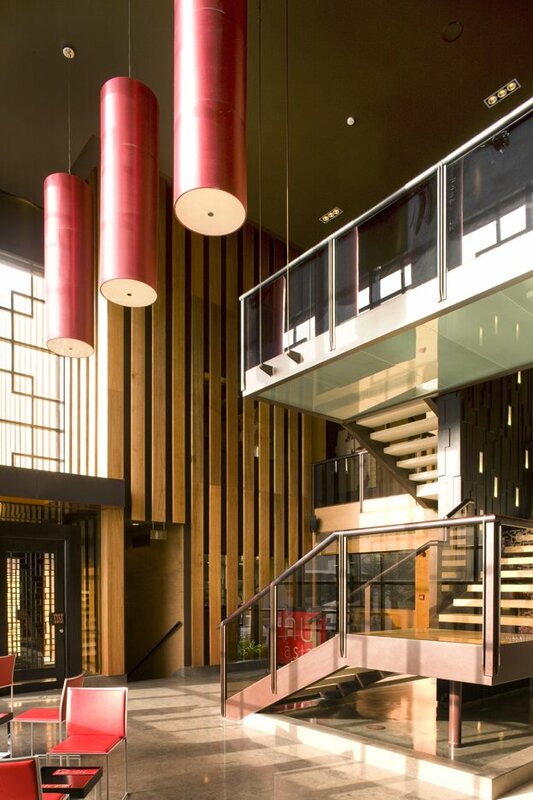 The dramatic upstairs dining area features several different zones, linked by a floating opaque glass bridge. Three private dining rooms are situated at the far left of the floor plan, over the entrance lobby below, with a timber screen wall between two of them (which references the external timber treatment), which can be retracted to create a double-size private dining space when required. 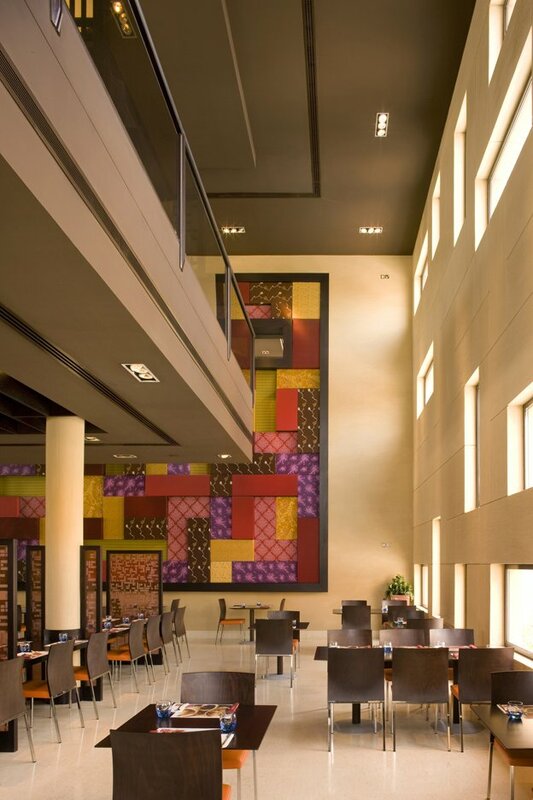 The centre of the space houses a large main central dining area, which floats off the perimeter walls, enabling the full size of the restaurant to be read clearly from both floor levels. 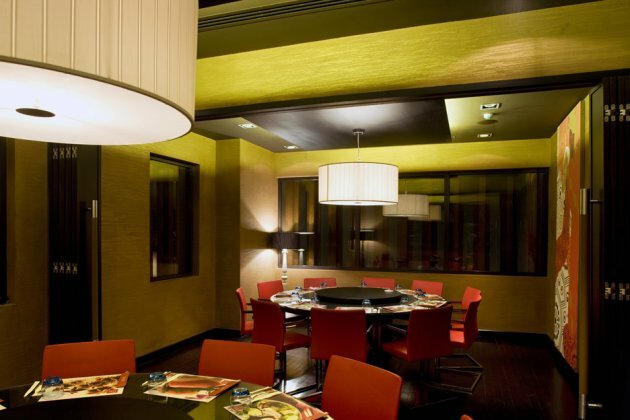 A third zone to the far right offers semi-private dining thanks to a number of glass-patterned screens, acknowledging the strong regional preference for privacy whilst dining. 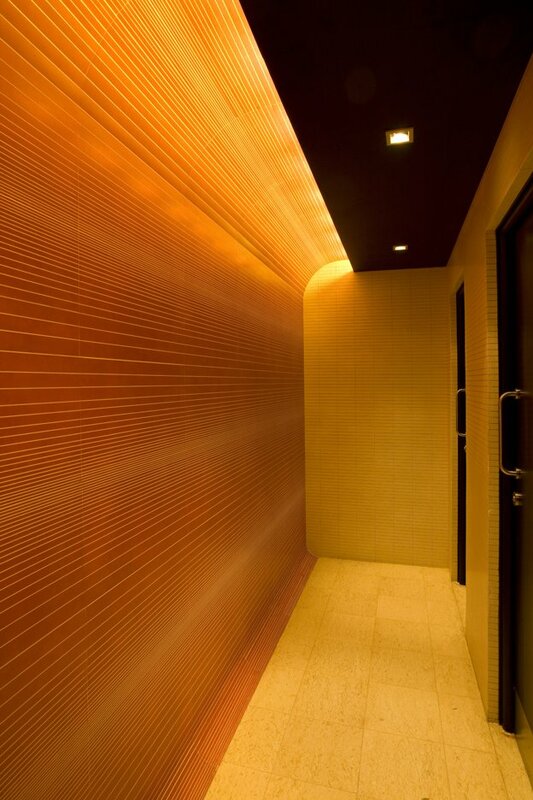 Lighting throughout is custom designed by SHH for the project. Most of the furniture on the project is also designed to be site-specific by SHH.